I made the bubble and squeak last night for dinner but I had a little left today so made it into a nifty little lunch, this stuff tastes even better the day after. Boil the potatoes and swede until tender and mashable. Fry the onions and leeks til soft and golden. Mash the potatoes and swede. Shred the cabbage and mix in with the potatoes and swede then add mix to the pan with the onions and leeks. Fry, squash, flip, fry. Make sure you encorporate all the lovely crispy bits, then flatten and squash to create a crusty base and flip to crispin up the other. Serve alone, with a fried egg, some bacon, sausages or use your imagination and accompany with something else. 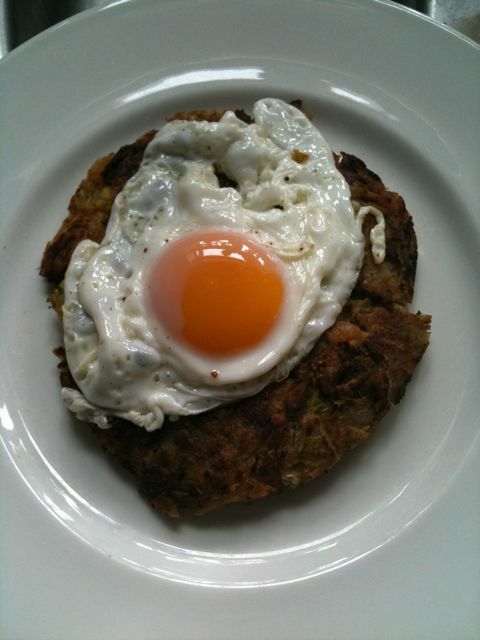 Easy peasy, bubble and squeak, squeak, squeak! 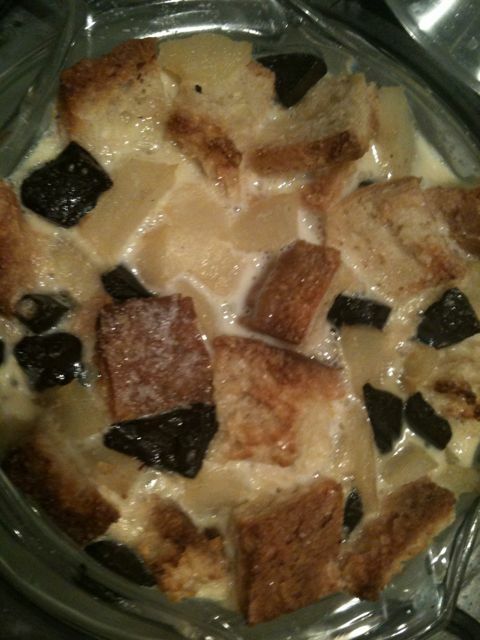 Another bread pudding I know! It’s this flipping gluten free bread it goes stale so quickly and I wouldn’t want to waste it now would I?! Serves 3/4 normal people 2 greedy pigs! Pre heat oven to 150 degrees. Cut the bread into cubes and put into ovenproof dish. Sprinkle over and mix in between the chocolate, broken up into little chunks, and the pear. Whisk up the eggs, milk, sugar and vanilla extract. Pour custard mixture over bread til almost full. I then weighed mine down for a ten or so min with a lid to make sure all the bread cubes got a thorough soak, if you can be more patient wait longer and leave in fridge until needed. 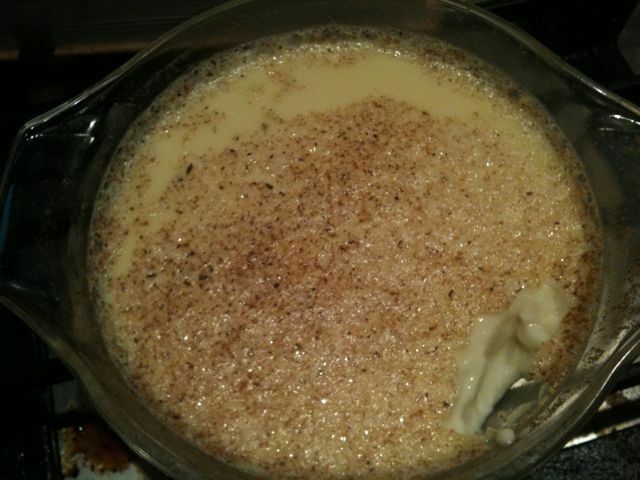 Place pudding dish in a larger pan or dish and fill with jusy boiled water (bain marie). Sprinkle over teaspoon of sugar to creat crunchy top. Put in the oven for 45/60 min until just set. Leave to cool slightly before eating, remember I burnt my tongue last time! 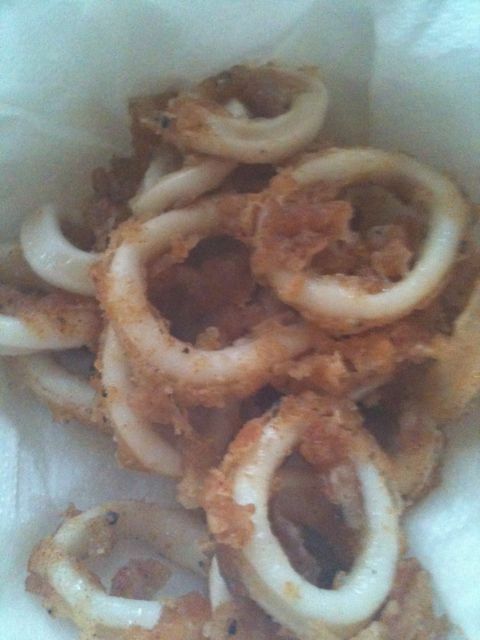 Squid rings, I used frozen from my beloved Wing Yips and defrosted in a bowl of water but I’m sure fresh would be lovely, much easier this way though! Mix cornflour, paprika, salt and pepper in a bowl. Toss squid through until evenly coated. Heat oil in large frying pan, about a cm deep. Check temperature by throwing a cube of bread in oil, if it bubbles and begins to golden then it’s ready. Gently put rings in oil, don’t overload, best to do in batches. Fry for about a min or so until crispy and golden. Be careful not to overcook as they end up like rubber! Drain on kitchen towel and plate up. I went on a little trip to Wing Yips Chinese Supermarket yesterday in search of few little oriental bits and with the desire to purchase some roast duck. Sometimes the urge just grabs me! Anyways big up to Wing Yips, I love this place. I grew up in Birmingham with the luxury of the one in Duddeston which was a short drive away and am very lucky to have a super chef dad who would take me to wonder round the aisles of new and exotic foodstuffs. I always remember him pointing out the live lobsters in the tanks and looking at all the strange and wonderful products. As a result my first knife was a clever (super massive knife, great for intimidating silly boys with! B watch out!) from there and I love going round the place whenever I get chance. The one I go to now is in Croydon off Purley Way. It has a lovely chinese restaurant in the complex called Tai Tung which always seems to be busy whatever the day or time. Anyway it is in this restaurant you can buy the most delicious roast duck to take away, just like the bronzed and laquered ones you see hanging in Chinese restaurants and cafes in Soho. So after my wander round the aisles of Wing Yips I popped in to purchase half a roast duck. 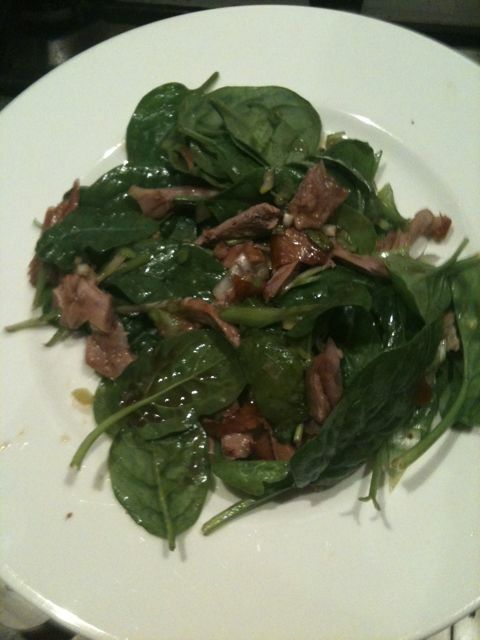 Cut the duck into strips and add to bowl. Add spring onions, and other salad ingredients. Mix together dressing, i know i’m crap at measurements but live a little and experiment, taste your way and you’ll work it out! Pour dressing over salad. Toss. This is like Duck and Pancakes without the pancakes and really moreish. 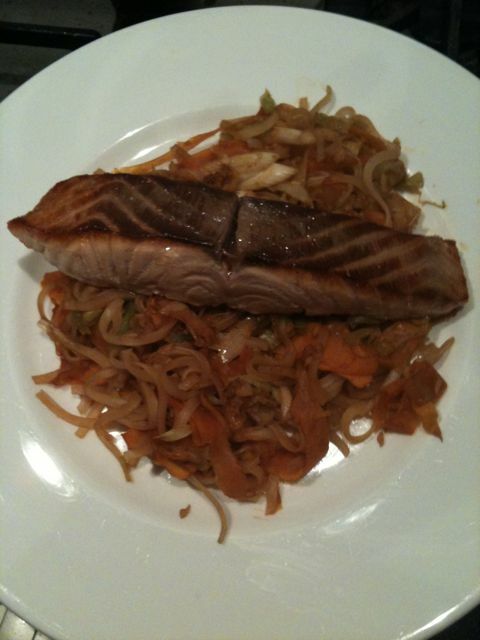 Recipe stolen and slightly tweaked from Hugh Fearnly Whittingstall’s ‘River Cottage Everday’. Place two halves in tray. Spinkle chopped garlic in to the holes of the squash. 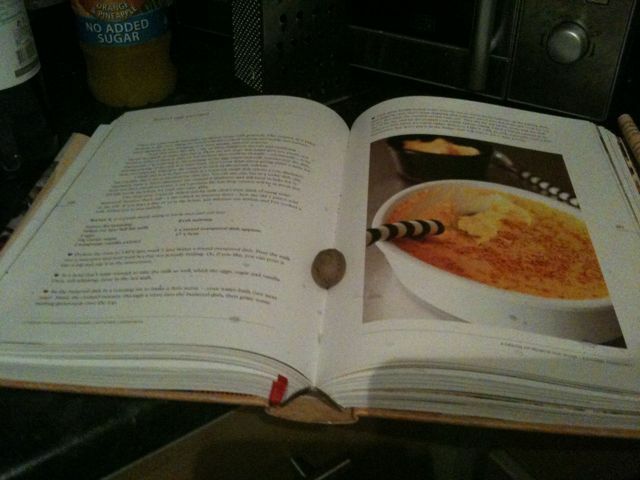 Add a knob of butter to each hole. Cook in oven for about 45 min or until squash is tender. Scoop out flesh leaving a little round sides to hold shape. Mash flesh in bowl with herbs, creme fraiche and plenty of seasoning. 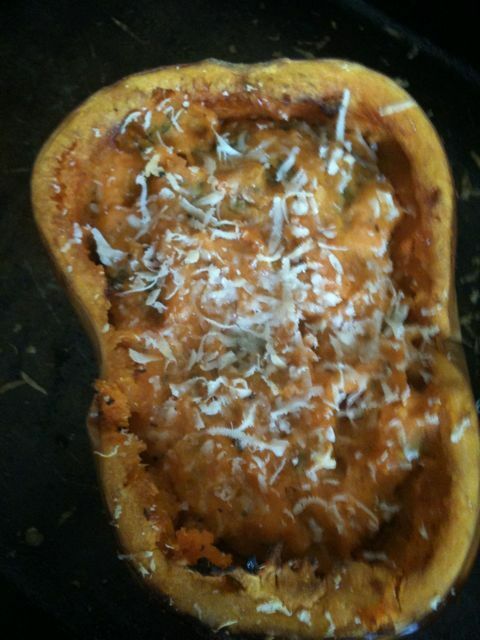 Return mixture to squash skins and grate on some Parmesan cheese. Put back in oven for ten min.